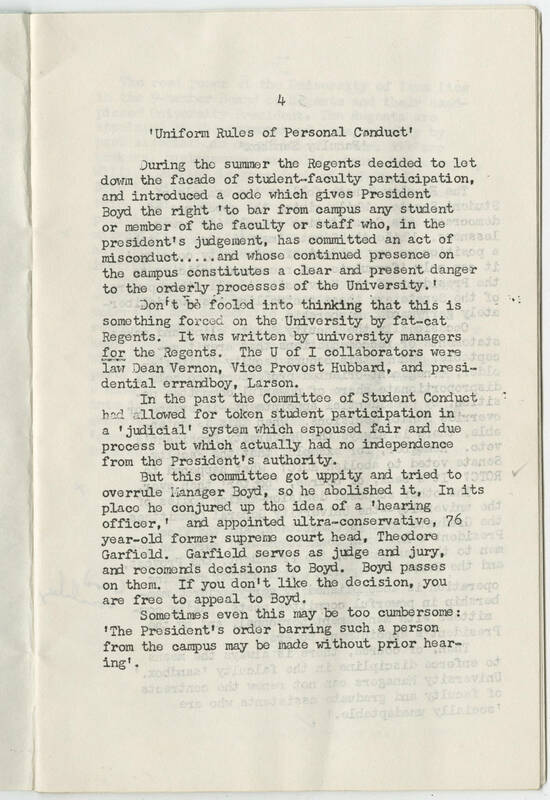 4 'Uniform Rules of Personal Conduct' During the summer the Regents decided to let down the facade of student-faculty participation, and introduced a code which gives President Boyd the right 'to bar from campus any student or member of the faculty or staff who, in the president's judgement, has committed an act of misconduct .... and whose continued presence on the campus constitutes a clear and present danger to the orderly processes of the University Don't be fooled into thinking that this is something forced on the University by fat-cat Regents. It was written by university managers for the Regents. The U of I collaborators were law Dean Vernon, Vice Provost Hubbard, and presidential errandboy, Larson. In the past the Committee of Student Conduct had allowed for token student participation in a 'judicial' system which espoused fair and due process but which actually had no independence from the President's authority. But this committee got uppity and tried to overrule Manager Boyd, so he abolished it. In its place he conjured up the idea of a 'hearing officer,' and appointed ultra-conservative, 76 year-old former supreme court head. Theodore Garfield. Garfield serves as judge and jury, and recommends decisions to Boyd. Boyd passes on them. If you don't like the decision, you are free to appeal to Boyd. Sometimes even this may be too cumbersome: 'The President's order barring such a person from the campus may be made without prior hearing."